Swedish Ending Quest take their name from the one and only album by their countrymen Gorement, the album which is supposed to be a classic in death metal scene. Sadly, and honestly, I have not heard Ending Quest by Gorement, but that problem is correctable as an album (+ an old demo collection) is on their way to me, the re-issue having been already purchased on evilBay. What is very clear about Ending Quest debut, The Summoning, they do not only take their moniker from old school Swedish death metal, they eat, drink, preach and play it. Moreover, while many other young Swedes, and not only Swedes, are trying their hardest to resurrect the sound of 90s death metal, Ending Quest stole the keys and broke into Sunlight Studios. 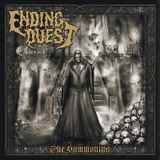 It is one thing to WANT to sound like an old Grave or Entombed album, but Ending Quest actually DO sound like one. In fact, those two should be sending requests for royalty payments, having heard Eradicate or Evocation of Carnal Flesh. Having thrown caution to the wind, Ending Quest are going bonkers on Eradicate. Tragically, and purposefully, devoid of all high frequency in production, cymbals sounding tinny, Ending Quest come out with characteristic tubed out sound, bobbing along to the beat, catchy more than sticky tape might be to flies. At the same time, what absolutely characterizes Ending Quest on The Summoning is the amount of playfulness they seem to put into their music. Setting aside the lyrics, it seems that the main theme while creating the album was how to have FUN. And after fun was had, more fun was still prescribed. This is raw brutality not to punish the listeners’ ears, but to take him along on an exciting pleasurable ride. Fun, however, does not substitute for two-note riffs on the album, or overt simplicity. Ending Quest are actually pretty adept at involved songwriting. They do numerous tempo variations within songs (A Host of Flesh), go from breakneck speeds to drawn out stretchy leads (Evocation of Carnal Flesh, Grotesque Abolishment), with bass contributions in the latter song, pop out an air-raid siren alarmist solo or D-pummel you to smithereens (Voices, The Lament Configuration), invoke a mid-Eastern motif on Sumerian Invocation or drop in a totally unexpected background piano (Evocation of Carnal Flesh). Towards the end, with Destruction of the Firmament and Exalted and Fireborn, the songs start rolling one into another, losing individuality a bit, perhaps because Ending Quest tend to drag on beyond what is the sweet-spot length of Eradicate, Evocation of Carnal Flesh and Voices. And when they want to sound more serious, on the bookends of Black Death and The Lament Configuration, I don’t seem to enjoy it as much as when FUN is the recipe. Not entirely original, with exactly the purpose of not being such, Ending Quest are utterly enjoyable, if you are into old school Swedish death metal. And did I mention FUN?